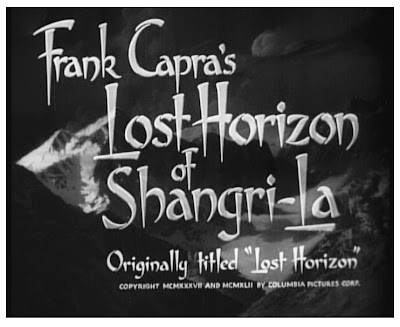 Frank Capra's 1937 picture "LOST HORIZON" based upon the novel by James Hilton was by all accounts the most adventurous decisions to 'green light' a picture that Columbia mogul Harry Cohn had ever undertaken to date. 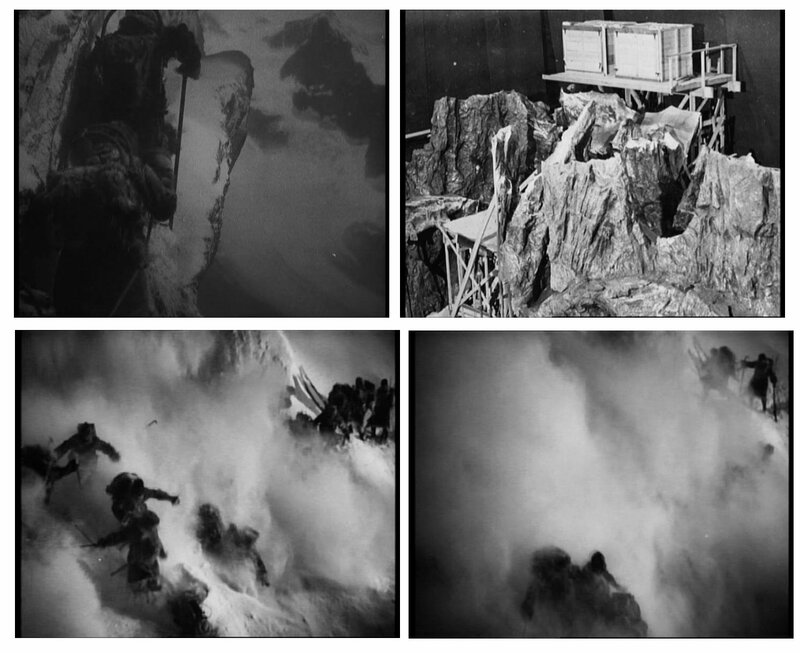 The story of a group of people plane wrecked somewhere near Tibet and their finding a lost city hidden among the alps was more than a simple adventure movie - far more. The almost unfilmable novel was steeped in philosophical discussion and complex arguements on what is the essence of peace and harmony - coupled with real life international tension as impending war loomed in Europe this was never going to be an easy shoot. 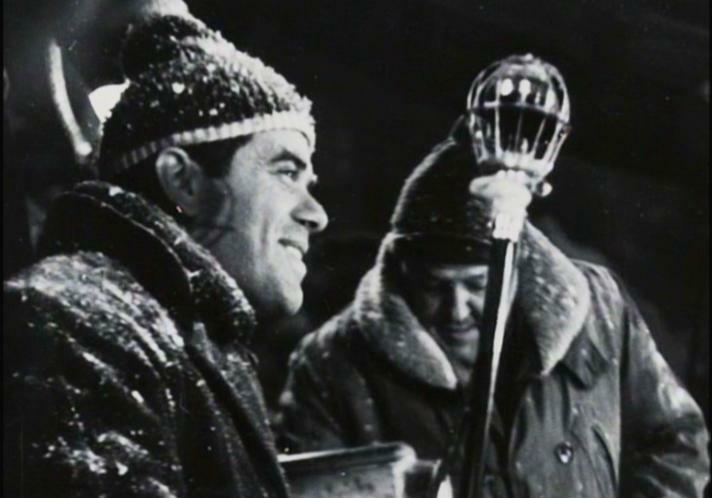 Frank Capra on the chiller set for the snow sequences. 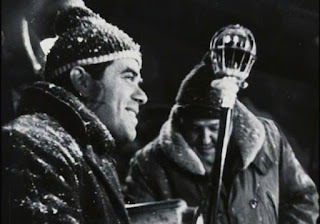 Director Capra was Columbia's darling - having helmed the brilliant "MR DEEDS GOES TO TOWN" the previous year for which he deservedly won the coveted Oscar - certainly a feather in the cap of an arguably economic little studio like Columbia - the K-Mart of movie studios - no fuss, get on with it, do it fast style of film making. "LOST HORIZON" was not an easy adaptation, and Capra was pretty determined, along with screenwriter Robert Riskin to serve the novel to the best of their ability. There's no doubt that star Ronald Colman was the perfect choice here and his status and ability did much to sell the film to a unsuspecting public. The original preview cut was some 4 plus hours in length and in keeping with the wordiness of Hilton's novel several sequences involving speeches and conversation actually went on for 40 odd minutes a piece! 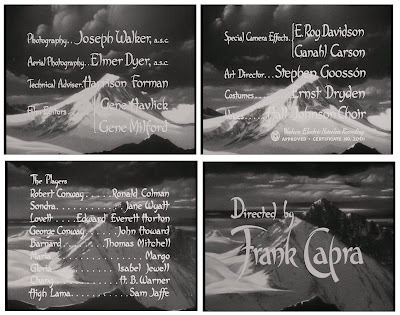 The final cut by Capra with Cohn's approval was 132 minutes though this too went through a number of re-cuts, retitlings and censorship over the years with a number of differing versions circulating. Master of light - cinematographer Joseph Walker. The film holds up surprisingly well even today in a restored format that fulfills Capra's original theatrical edit. The production value is superb with exquisite cinematography by Joseph Walker and art direction by Stephen Gooson. 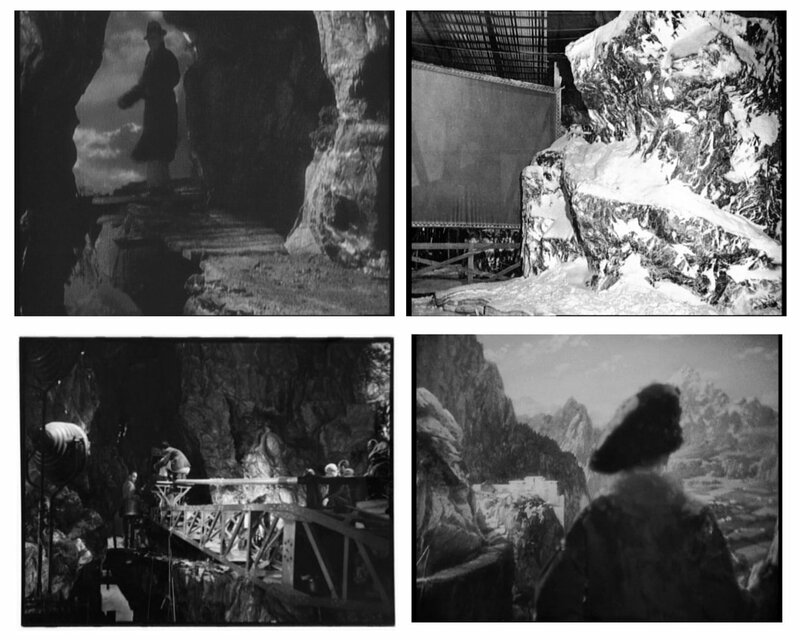 So too are the special photographic effects by E.Roy Davidson and Ganahl 'Kit' Carson. I can tell you next to nothing about Carson but Davidson is another story. 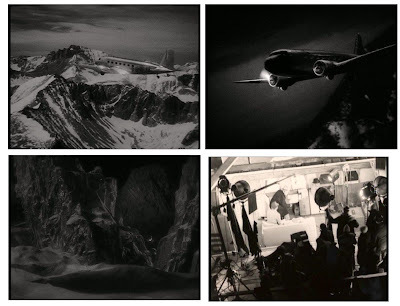 Roy was born in 1896 and was in charge of the 'Special Camera Effects' department at Columbia from the early thirties working on a number of films and received an Oscar nomination in 1939 for the miniature airplane effects in "ONLY ANGELS HAVE WINGS". Around 1940 Davidson moved over to Warner Brothers and was chief of 'Stage 5' as the Warners special effects department was then known. 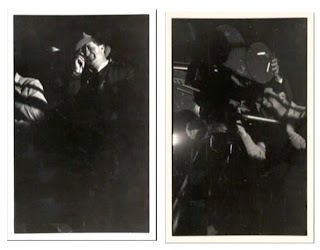 Davidson supervised the photographic effects on a number of films including the astonishing matte work in "RHAPSODY IN BLUE" in 1945 (which I will upload here as a topic in the very near future). Among Roy's many other credits at Warner Bros were the exploding oil refinery at the end of "WHITE HEAT" and assisting Jack Cosgrove with the huge number of miniatures and matte shots in Michael Curtiz' "PASSAGE TO MARSEILLE" among others. Roy died in 1962. 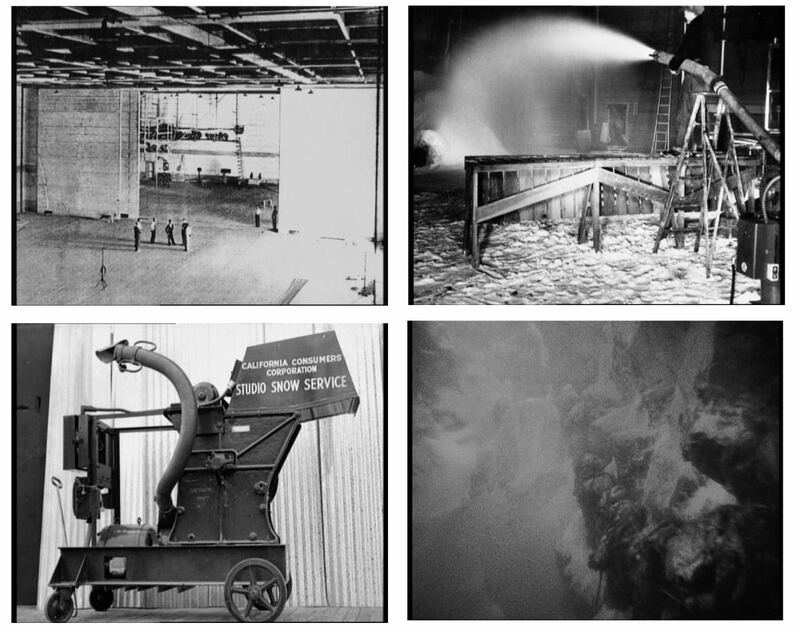 Also on the effects crew was Harry Redmond jr - a veteran who's long career in mechanical effects goes way back to the Willis O'Brien "KING KONG" (and that wasn't one of his first pictures either). Noteworthy is the fact that Redmond was married to one of the conceptual artists on "GONE WITH THE WIND", Dorothy Holt. 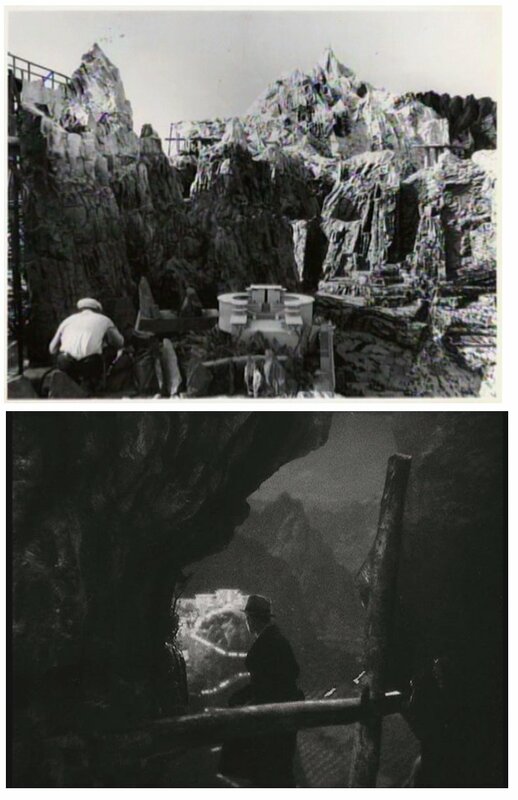 As far as I know Harry is still alive today and is rumoured to be the only surviving crew member from "KONG". 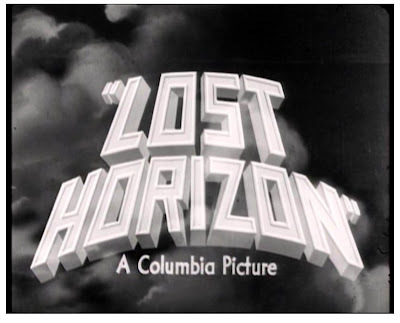 "LOST HORIZON" isn't an 'effects' picture, though that doesn't mean automatic exclusion from my interests in visual effects. The matte shots are few and far between, as are a few miniatures and some process work, but in toto these elements help to tie together Capra's vision and are kept at a minimum...something that today's MTV reared directors and effects supervisors could do well to learn from. *Oh, and no, I haven't seen the disastrous 1972 remake with Peter Finch and Liv Ullman, though I believe it is abysmal - effects and all! 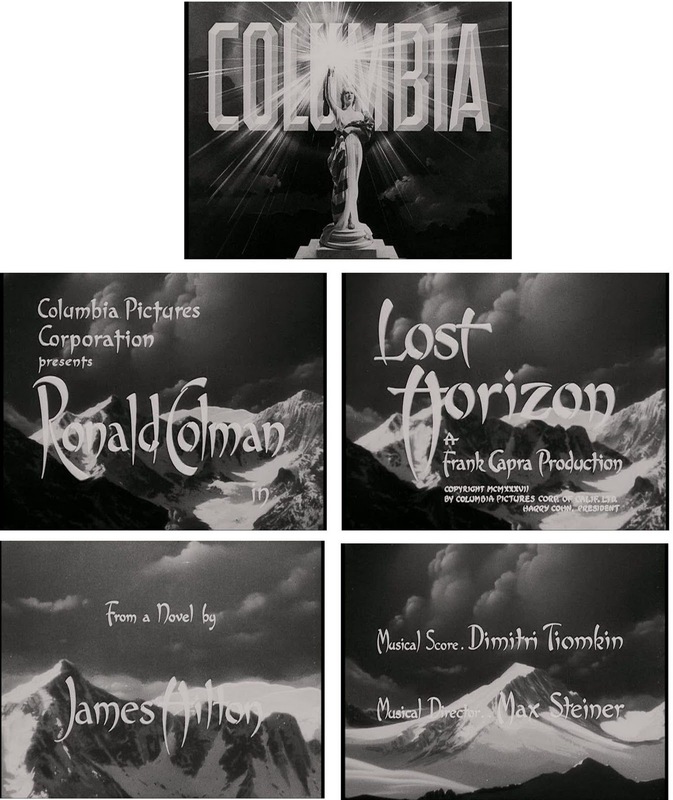 I love old title cards - nothing today compares I'm afraid. The title sequence is beautiful and elaborate so I have included many frames as the camera glides over valleys and peaks - all created in the special camera effects department at Columbia under E.Roy Davidsons' supervision. 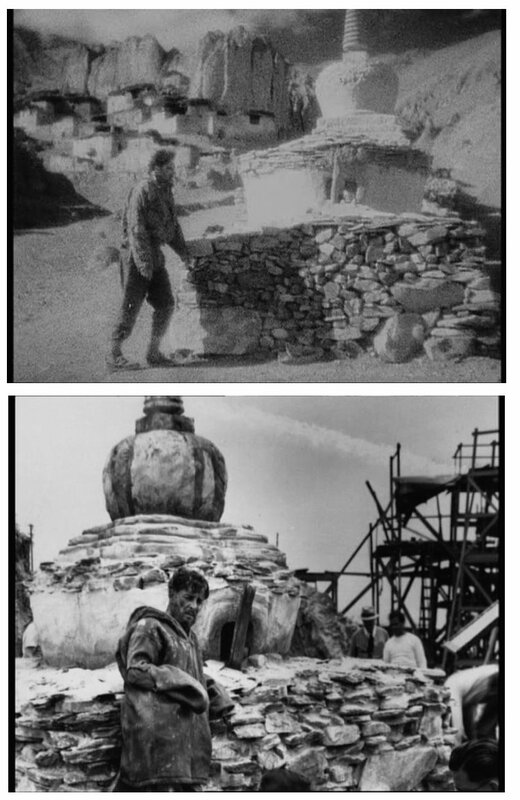 It was common place for the special effects departments in the old days (and even more recently such as "STAR WARS" for example) to create and be responsible for the entire title crawl artwork and special composites required. The doomed flight - a miniature plane in front of a process screen with wires occasionally visible; with crash at lower left and an interior plane cabin process set up seen lower right. The full sized mock up built in a large coolstore chilled sufficiently to allow the actors breath to be visible. The lower shot shows the set with an effective painted backing. 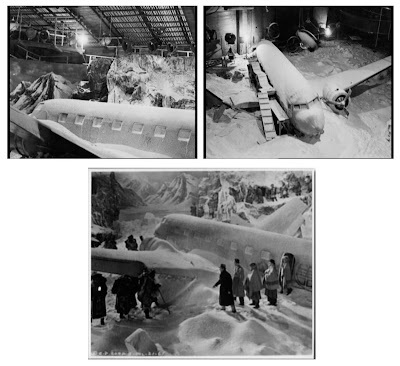 Upper left - the merging of two stages at Columbia to provide space for the large sets; other photos show the snow making machinery at worksupervised by Harry Redmond jr. Actual ice was crushed up with other matter to provide as realistic a sense of snow as possible - which was unusual for a 1930's picture. 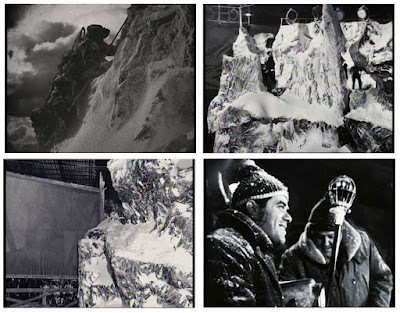 The avalanche as shot on a set in the coolstore showing the rock facades and the large chambers of 'snow' built by Harry Redmond jr which was released upon the actors in a chillingly believable sequence that was entirely practical and no opticals were employed. Wonderfully designed blizzard sequence shot on the set with a large process (rear projection) screen seen for projection of clouds, windswept peaks etc. 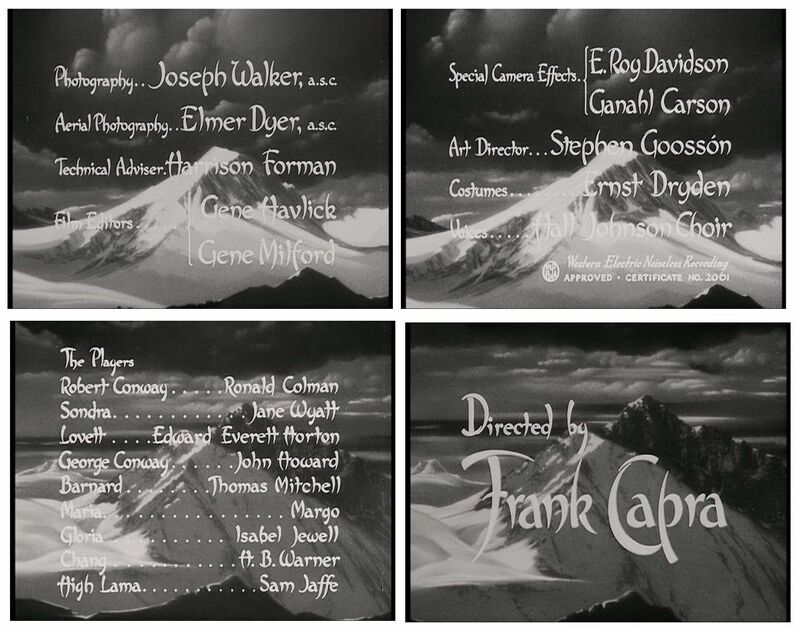 Lower right is Frank Capra on the set. 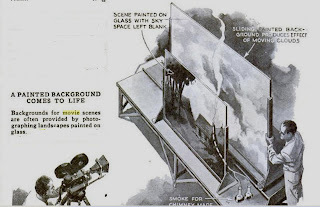 The process screen in use for the arrival sequence. Also visible is the then brand new camera crane at Columbia. The approach to the temple - various photos show the stages of construction prior to the addition of the matte painting. 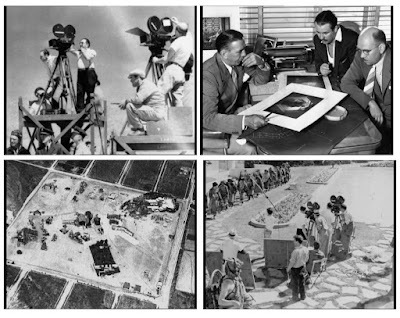 Upper left - the whole show was a multi camera affair with as many as five cameras covering some scenes; upper right is art director Stephen Gooson with his design team going over concepts for the interiors; lower left is an aerial view of the huge set built at Columbia ranch as it was then known; lower right Capra and team shooting the arrival. The departure at night - Shangri-la as seen from the secret passage through the mountain. This shot is a partial miniature partial glass painting. 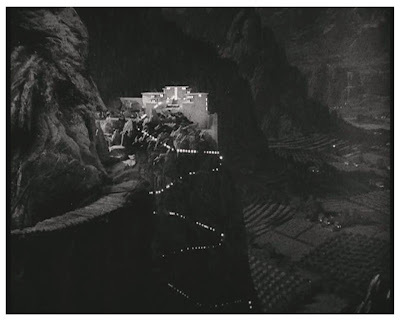 The middle mountain with the city is a miniature and the ascending monks with torches are a motorised 'train' system - this in turn was combined with the glass painting of the valley floor and distant mountains. The miniature of Shangri-la; Ronald Colman farewelling 'paradise' via a process shot. The long journey home - I tend to think this upper frame is of a real glacier as snow falls down it. A number of stock shots and second unit views such as this are featured, often very poorly due to severe grain and mismatch of contrast and film stock etc. 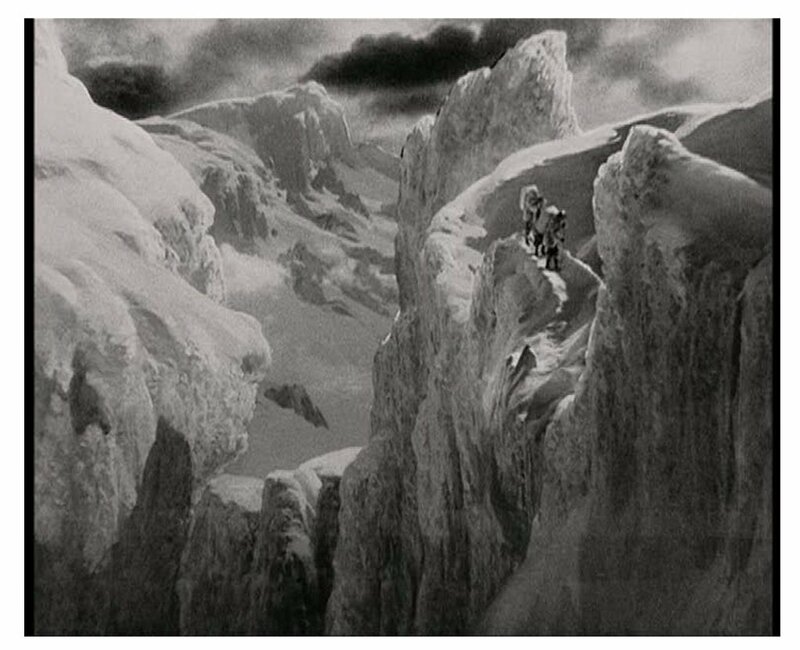 An exquisite matte shot with Colman crossing the glacier - really a beautiful visual effect with moving clouds possibly painted on a second glass positioned behind the main painted glass. To give an example of the multi-plane effect I feel was used in the above glacier matte this unrelated diagram from an old movie magazine nicely demonstrates the method. 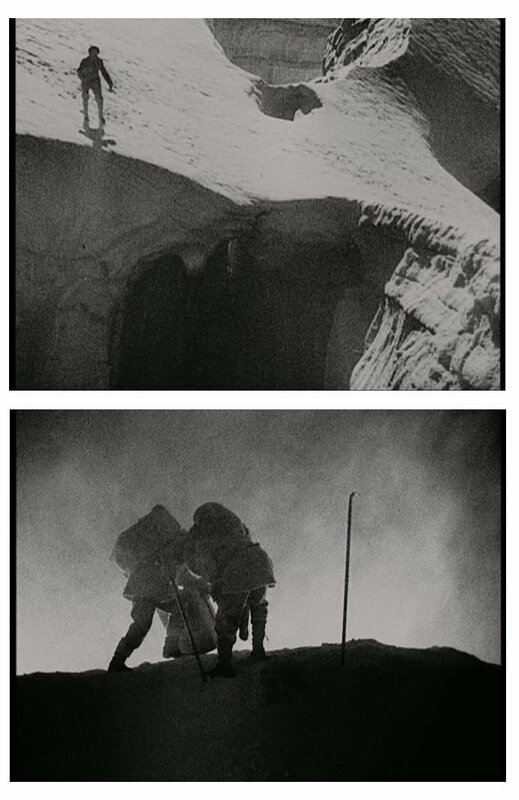 Bedraggled and blistered, Ronald Colman arrives at some semblance of civilisation. I tend to think this is a matte shot due to the production photo seen here which doesn't show any detail beyond the foreground structure. 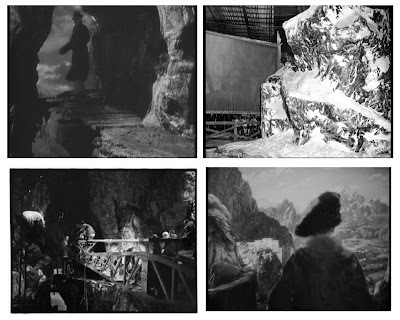 The middle shot is a fascinating out take of robed monks climbing a spiral staircase shot directly from below, with what i suspect is a matte painted ceiling atop the set. Bottom frame is director Capra conferring with another esteemed cinematographer, Joseph Ruttenberg (who did amazing work on MGM's "GASLIGHT"). 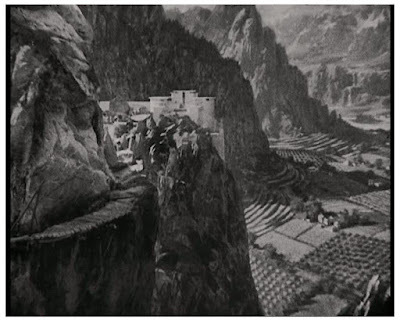 Ruttenberg was brought on board to reshoot some sequences involving the Lama character - a problematic character to write for, direct and headache inducing for Capra to shoot and edit while still maintaining the audiences' interest as the speeches in those sequences went on for up to forty minutes in the original rough cut. Of interest here is the World War II re-issue title card whereby Harry Cohn heard a military reference to 'Shangri-la' that stuck in the nations ears so being the shameless opportunist he was he quickly retitled (and radically re-cut) the film to capitalise on this new found 'catchphrase'. Oddly enough the picture was quite extensively censored to remove the (quote) "pacifist overtones" during WWII with alot of bits of dialogue being trimmed and entirely new plotl ine intertitles substituted. Totally fascinating! Where are some of these fabulous behind the scenes production shots coming from? Just found your blog and am LOVING it. Enjoyed the shot of the Columbia (or as Cohn once spelled it, "Colombia") ranch. I was just there today. A big chunk of it is a shopping center now. Through the miracle of Google searching I found your site. 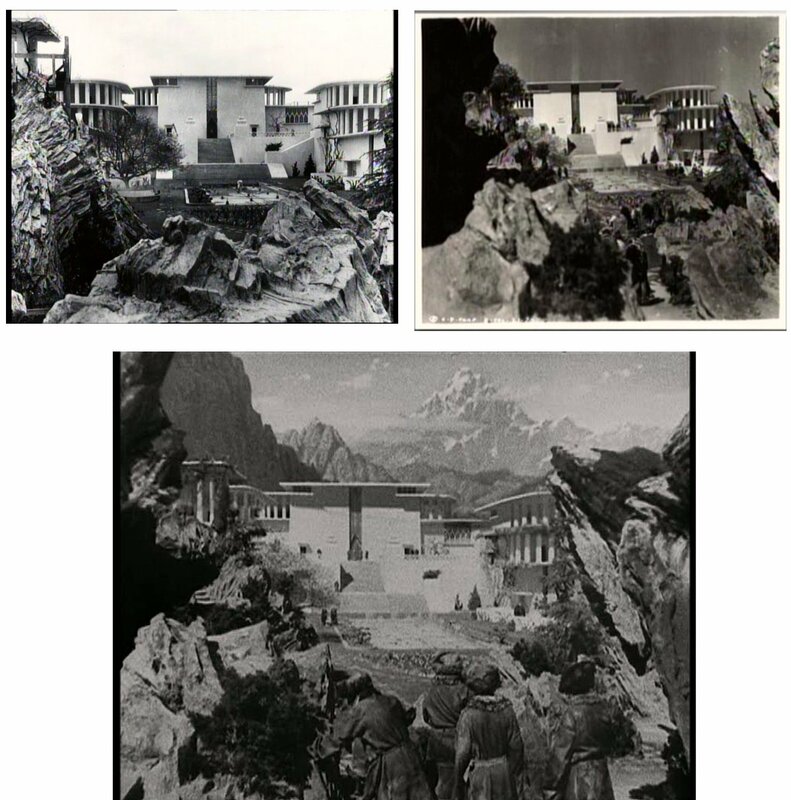 After learning that the lamasary in Lost Horizon was a giant set, I wanted to find a picture of the building structure in Burbank at the time. I'm so pleased I found your site as I have learned a great deal about mattes and about moving making. Keep up the good work! Harry Redmond, Jr., (special effects, mentioned above) died on May 23, 2011 at age 101.